You can make a gummy bear in any flavor you want. But should you? Let me tell you about the day I lost control of my life and made 12 different flavors of homemade gummy bears. I know that I let things get out of hand because my skin still has a few hardened streaks of gelatin that didn’t wash off in the shower. Is making your own gummy bears from scratch kind of fun? Sure. Yeah. But be prepared to confront a darkness you never realized was hiding dormant inside of you. All the recipes for every flavor of gummy I made are at the end of this post. If you’ve ever looked up a recipe on the internet, you know the person who made the thing gets to tell a long, rambling, incoherent story about their “journey” in making the thing. SO JUST LET ME HAVE THIS, OK? It all started when I learned you can buy gummy bear molds from the internet. I had the epiphany that you can make a gummy bear that tastes like ANYTHING YOU WANT. You just add gelatin. My mind was on fire with possibilities. Any drink can be a gummy bear. Any cocktail can be a gummy bear. Anything you can blend in a blender can be a gummy bear. Rum & coke gummy bear. Red wine gummy bear. Almond milk gummy bear. The world of gummy bears is almost limitless and once you feel that power, you will never be the same again. Gelatin is like having a super power. You can use it for good or evil. You can solidify anything you want. But it’s dangerous. Just look at the jello mold atrocities of the ‘50s and ‘60s. You become so obsessed with the things you CAN gel-ify that you don’t stop to question whether or not you SHOULD. I wanted to make some classic fruit flavors like strawberry or blueberry. But what about a LaCroix gummy bear? What about a tomato juice gummy bear? What about bloody Mary? Or bone broth? What about a clam juice gummy bear??? SAVORY GUMMY BEARS. I was drunk on gummy flavor potential. I went to the grocery store and bought all the gelatin they had. That’s not an exaggeration. I cleaned them out. And I would eventually use it all. I decided to start with strawberry. The process is simple—you mix up your liquid and gelatin, put it in the molds, and let it set in the fridge—but it can go wrong. My first batch was a bad batch of gummy failure. I didn’t use enough gelatin. Because I was scared. If you use too much gelatin, the texture gets hard and weird. I didn’t want the bears to taste like rock-hard jello. I only used one packet of gelatin, but it made the bears soft, weak, and slimy. No one ever said, “I like gummy bears but I wish they were wetter.” I had to crank up the gelatin. Crank it way up. There was no turning back. My next batch was a Manhattan cocktail bear. I used whiskey, maraschino cherry syrup, bitters, and I blasted that mixture with three packets of gelatin. And it actually worked. They looked good and the whiskey made them taste like an episode of Mad Men. I’m sure this gummy bear is something Don Draper would spit into the trash but I thought it tasted pretty good. The most difficult part of the process was taking the bears out of the mold. Once I nailed the formula, I just kept making new flavors. Creamsicle, coffee, apple cider (for fall! ), matcha, rosé, and margarita with tequila, lime, and salt. A tiny part of me kept screaming inside my brain “Maybe you should stop making gummy bears now.” But I couldn’t stop. I went into a robotic, bear-making state for hours. I’m almost too embarrassed to say how many gummy bears I made. IT WAS MORE THAN 1000 GUMMY BEARS. I wanted to find the perfect flavor. The most exotic flavor. I laugh in the face of fruit flavors. And then I maybe took it too far. Because I made a kale gummy bear. Why? Honestly, just to troll people. I wanted to make people say, “KALE gummy bears?! That’s it! This kale thing has gone too far!” I didn’t expect them to taste good. And someone did say they tasted like fish food. But I honestly liked them. I added green apple and lime juice so they just kind of taste like green juice. You can suspend things in gelatin. Things like rainbow sprinkles. I didn’t know if it would work, but I set out to create a confetti gummy bear: clear gelatin with rainbow sprinkles. I gave it a vanilla flavor and named it “birthday cake.” And it actually kind of...worked? One person said it really tasted like birthday cake. Have you ever seen anything like this? No. You haven’t. Does this look cool or seriously messed up? Let’s go with both. So how do homemade gummy bears taste? The texture is definitely different from that of a store-bought gummy bear. When people tried them, some found the texture to be upsetting or like “off-brand fruit snacks.” It's hard for me to find another word to describe the taste beyond "interesting." They don't taste bad. They're maybe even kind of good? Who should make homemade gummy bears? Probably no one. But I would recommend them if you have an unusual flavor you want to try (I'm still kicking myself for not making a turmeric ginger!) or if you want to make a slightly healthier candy alternative. But mostly, you should make your own gummy bears if you want to feel powerful, like the laws of candy don’t apply to you, and you desire hundreds of tiny, edible friends. Sprinkle rainbow sprinkles inside the empty gummy bear molds. Mix water, sugar, and vanilla. Pour half of the mixture into a small saucepan and heat until simmering. Mix gelatin into the remaining half of the mixture. Add simmering liquid to the gelatin mixture and stir until the gelatin is dissolved. Fill the gummy bear molds with the liquid using the dropper and refrigerate for two hours or until set. Remove the bears from the molds. Makes about 100 bears. Mix rosé and sugar. Pour half of mixture into a small saucepan and heat until simmering. Mix gelatin into the remaining rosé and sugar mixture. Add simmering rosé mixture to the gelatin mixture and stir until the gelatin is dissolved. Fill the gummy bear molds with the liquid using the dropper and refrigerate for two hours or until set. Remove the bears from the molds. Makes about 100 bears. Notes: As you can see, these bears look mostly clear. The pink color fades from the wine. To keep them pink, try to find a darker rosé or add food coloring. Mix whiskey, cherry syrup, bitters, and sugar. Pour half of the mixture into a small saucepan and heat until simmering. Mix gelatin into the remaining half of the mixture. Add simmering liquid to the gelatin mixture and stir until the gelatin is dissolved. Fill the gummy bear molds with the liquid using the dropper and refrigerate for two hours or until set. Remove the bears from the molds. Makes about 100 bears. Blend strawberries in a blender. Strain the blended strawberries through a mesh strainer to remove seeds. Add lemon juice and sugar to the strained strawberry mixture. Pour half of the mixture into a small saucepan and heat until simmering. Mix gelatin into the remaining half of the mixture. Add simmering liquid to the gelatin mixture and stir until the gelatin is dissolved. Fill the gummy bear molds with the liquid using the dropper and refrigerate for two hours or until set. Remove the bears from the molds. Makes about 100 bears. Mix apple cider, sugar, and lemon juice. Pour half of the mixture into a small saucepan and heat until simmering. Mix gelatin into the remaining half of the mixture. Add simmering liquid to the gelatin mixture and stir until the gelatin is dissolved. Fill the gummy bear molds with the liquid using the dropper and refrigerate for two hours or until set. Remove the bears from the molds. Makes about 100 bears. Mix orange juice, coconut milk, sugar, and vanilla. Pour half of the mixture into a small saucepan and heat until simmering. Mix gelatin into the remaining half of the mixture. Add simmering liquid to the gelatin mixture and stir until the gelatin is dissolved. 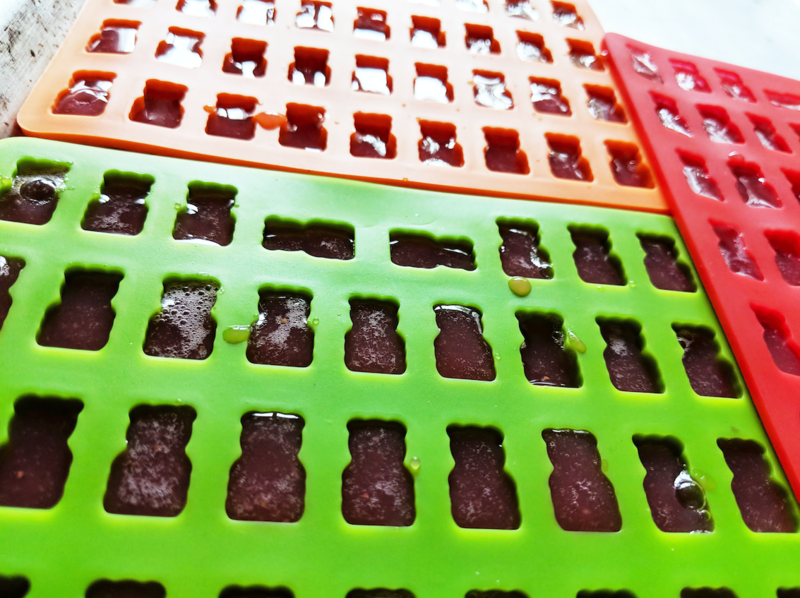 Fill the gummy bear molds with the liquid using the dropper and refrigerate for two hours or until set. Remove the bears from the molds. Makes about 100 bears. Blend coconut milk, matcha powder, and sugar in a blender until smooth. Pour half of the mixture into a small saucepan and heat until simmering. Mix gelatin into the remaining half of the mixture. Add simmering liquid to the gelatin mixture and stir until the gelatin is dissolved. Fill the gummy bear molds with the liquid using the dropper and refrigerate for two hours or until set. Remove the bears from the molds. Makes about 100 bears. Blend water and kale in a blender until smooth. Strain the kale mixture through a mesh strainer. Mix strained kale juice with lime juice, apple juice, and sugar. Pour half of the mixture into a small saucepan and heat until simmering. Mix gelatin into the remaining half of the mixture. Add simmering liquid to the gelatin mixture and stir until the gelatin is dissolved. Fill the gummy bear molds with the liquid using the dropper and refrigerate for two hours or until set. Remove the bears from the molds. Makes about 100 bears. Blend blueberries and lemon juice in a blender until smooth. Strain blueberry mixture through a mesh strainer. Mix the strained blueberry juice and sugar. Pour half of the mixture into a small saucepan and heat until simmering. Mix gelatin into the remaining half of the mixture. Add simmering liquid to the gelatin mixture and stir until the gelatin is dissolved. 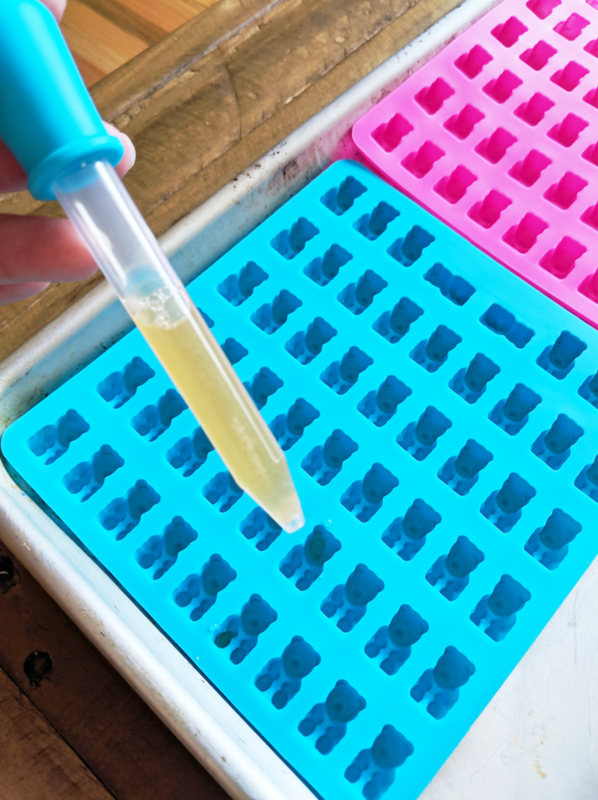 Fill the gummy bear molds with the liquid using the dropper and refrigerate for two hours or until set. Remove the bears from the molds. Makes about 100 bears. Mix coffee and sugar. Pour half of the mixture into a small saucepan and heat until simmering. Mix gelatin into the remaining half of the mixture. Add simmering liquid to the gelatin mixture and stir until the gelatin is dissolved. Fill the gummy bear molds with the liquid using the dropper and refrigerate for two hours or until set. Remove the bears from the molds. Makes about 100 bears. Mix coffee, sugar, and coconut milk. Pour half of the mixture into a small saucepan and heat until simmering. Mix gelatin into the remaining half of the mixture. Add simmering liquid to the gelatin mixture and stir until the gelatin is dissolved. Fill the gummy bear molds with the liquid using the dropper and refrigerate for two hours or until set. Remove the bears from the molds. Makes about 100 bears. Mix tequila, lime juice, sugar, and salt. Pour half of the mixture into a small saucepan and heat until simmering. Mix gelatin into the remaining half of the mixture. Add simmering liquid to the gelatin mixture and stir until the gelatin is dissolved. Fill the gummy bear molds with the liquid using the dropper and refrigerate for two hours or until set. Remove the bears from the molds. Makes about 100 bears. ∙ Place the gummy bear molds on a baking sheet before you fill them. ∙ It's OK to have a few undissolved gelatin clumps in your liquid mixture. You can avoid them if you use the dropper that comes with some molds. ∙ When removing the bears from the mold, push them out feet first. The feet tend to get stuck if you push them out last. ∙ The flavor of your gummy bears will fade as they solidify. Try to make the flavor stronger than you think you'll need. If you're making a fruit flavor, adding lemon juice can help boost the flavor. ∙ When your bears are completed, you can give them a chewier texture by letting them sit out exposed to air for about eight hours. Standing them upright as they dry will make them even chewier. ∙ I recommend storing in an air-tight container in the fridge. *There are some things that probably won't work, but there's a lot of room to experiment.